Happy Monday, loves! Oh do I have the perfect recipe to start your week right or what! I've been on a bit of a granola kick lately. After my Cocoa Banana Granola Recipe, I've been playing around with different grains, seeds, nuts, sweeteners, binders, flavours - you name it, I've tried it. With all of my experimenting, I've found one clear winner - Crunchy, clustery granola with quinoa flakes. With 4 bags of quinoa flakes in my cupboards (obsessed? yes) it's only human that i'd be looking for recipes using quinoa flakes, right? 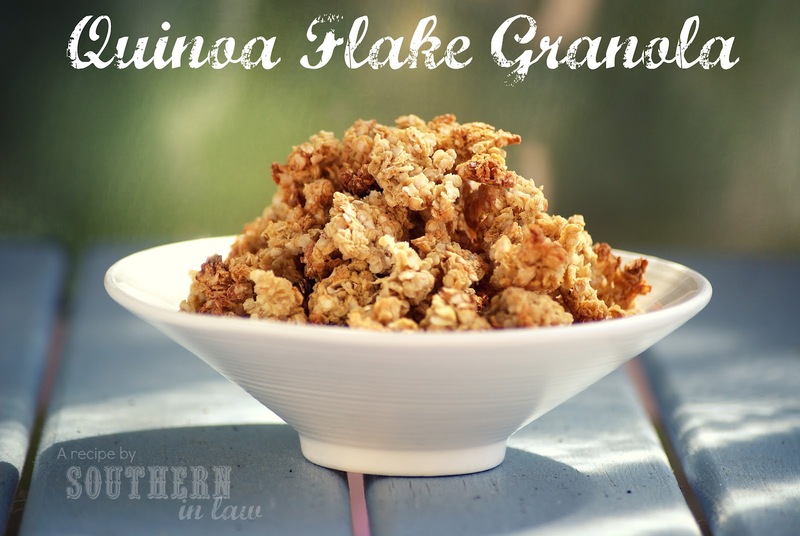 Not only are quinoa flakes gluten free, they're also high in protein and are low GI. 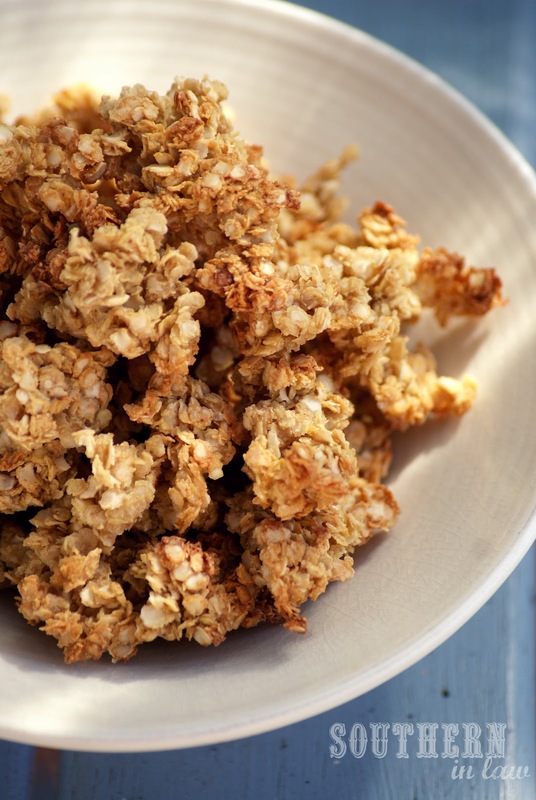 When it comes to granola, my favourite part are the clusters. 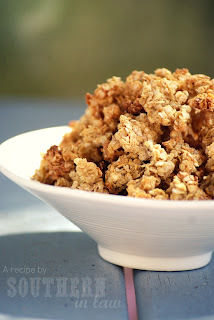 Big, chunky, crunchy clusters are always what I go for when pouring a bowl of granola. I even strategically pour granola into my bowls so that I make sure I evenly distribute the clusters (major weirdo alert). Add raisins or chewy dried fruit and it only gets better! It may seem odd to use egg whites in this granola, but I promise you - they're the key to crispy, crunchy, cluster filled granola! As an egg hater, you can be assured that you can't taste a thing! Pour quinoa flakes into a medium mixing bowl. Combine egg whites, salt, vanilla and maple syrup in a small bowl and pour into the quinoa flakes. Mix until all of the quinoa flakes are covered and then pour onto a lined baking sheet. Spread out the granola mix slightly, making sure to leave clumps for clusters later on. Bake for 15 minutes until the granola is golden, before turning the heat down to 110°C/230°F until the granola dries out and crisps up. Once the granola is crisp and crunchy, leave the granola to cool completely before pouring into an airtight container. If using dried fruit, add this after the granola is cooked. Nuts and seeds can be added before or after, depending on how crunchy you like them. So tell me, what's your favourite part of granola? I LOVE granola!!! It is one of my most favourite snacks of all time. I had a bowl of granola or lunch today (pls don't judge LOL) because I had eaten so much meat yesterday! Looking at your pics I want more! Thank you for sharing this I have a big pot of quinoa flakes that needs to be used and this sounds perfect!! can you use regular uncooked quinoa instead of flakes?? I'm not sure to be honest - I know you can make granola with regular uncooked granola and other grains, however I've never done it myself and not with this recipe so I don't know how it would come out. I have tried it with oats and it worked perfectly. Fabulous! Thanks for letting me know it worked with the flax egg, Natalie - did you just use 1 tbsp flax + 3 tbsp water? I'll have to add that as an option! What is a quinoa flake?? ?